A way to look into the future using tarot cards came to us from medieval Europe. The symbolism of the cards embodied the great wisdom of the past, and for a long time divination by such a deck was the lot of the elect, equated with secret knowledge, inaccessible to the ordinary person. However, in our time, divination by the Tarot cards has become one of the most common ways to look into the future. The cards are used not only to learn about future events, to understand what hinders the achievement of goals, and to find a way to solve problems, but also for spiritual self-development: the symbolism of the Tarot is actively used in meditation. The standard Tarot deck includes 78 cards, which, in turn, are divided into two types: junior and senior arcane. Younger arcane games are represented by 56 cards of four suits, which can be compared with the suits of an ordinary playing deck: Wands (clubs), Swords (spades), Denaria (diamonds), Cups (hearts). Each suit, like playing cards, has its own numbering. Major arcana cards are not numbered: each of them is unique and has its own symbolic image and name. Before embarking on Tarot divination, it is necessary to clarify for yourself an important point: not a single card has an unambiguous interpretation. The meaning of the card is revealed only in the scenario, that is, in the aggregate of several cards. Therefore, the fortuneteller’s goal is to establish the relationship of all symbols, to see the whole picture and to interpret it correctly. Interaction with tarot cards, as a rule, sharpens the intuition and activates the knowledge that lies in our subconscious. It is with the help of the inner feeling that a person interprets the alignment. Interpretation of complex layouts requires solid spiritual preparation and considerable experience. But there are simple layouts that even a person who first took up such a guessing can easily cope with. The alignment, which will be discussed, helps to look into the near future, to see the difficulties that will arise on your way, and to choose the right way to overcome them. First, take a pack of junior arcane (56 cards). It is necessary to pull 4 random cards out of it. Lay them in the shape of a cross, leaving an empty space in the center, in the following order: the first is on the left, the second is on the right, the third is on top, the fourth is on the bottom. After that, draw two cards from the deck of senior arcana and place them in the center. Carefully look at the resulting alignment and begin to interpret it, starting with the first card. 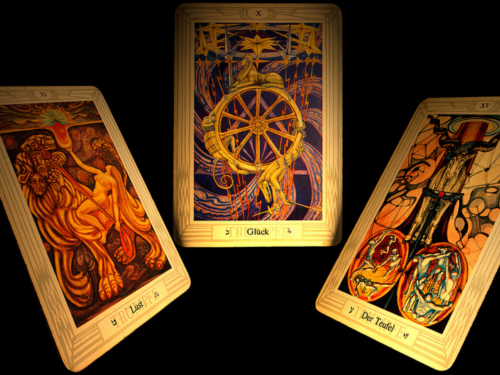 Two cards from the senior arcana, which are located in the center, are revealed last. They sum up the final result of fortune-telling, and foreshadow the final result of the coming life situation. The interpretation of senior arcana you can read by clicking on this link.